Choue Chung-won, new president of the World Taekwondo Federation, and other dignitaries watch cultural performances during the opening ceremony of the 5th World Junior Taekwondo Championships in Suncheon, southern Korea, on June 12.
International taekwondo events are taking place one after another in Korea in June 2004, drawing thousands of taekwondo contestants and officials from at home and abroad. The 5th World Junior Taekwondo Championships, which kicked off June 12 in Suncheon, southern Korea, concluded its seven-day event June 18. The biennial event drew about 1,500 taekwondo contestants and officials from a record 83 countries. The 2004 World Taekwondo Hwarang Festival began on June 18 in Jincheon, central Korea, drawing about 1,400 taekwondo players and officials from 44 countries. The annual event, which started in 2002, will continue until June 24. On June 30, the 2004 World Taekwondo Festival & 6th Korea Open is scheduled to start for an eight-day run in Cheongju, North Chungcheong Province. Under the theme "We are One Through Taekwondo," the festival, which kicked off in 1998, is expected to attract more than 1,000 taekwondo contestants and officials from 60 countries. "The three big taekwondo events are very meaningful for participating taekwondo players as they take place about two months before the 2004 Athens Olympics," said a ranking official at the World Taekwondo Federation, who asked not to be named. Taekwondo, a traditional Korean martial art, was adopted for the first time as an Olympic medal sport at the 2000 Sydney Olympics and is staged as an Olympic sport at the forthcoming 2004 Athens Olympics. The Seoul-based WTF elected a new president at its extraordinary general assembly on June 11 in Incheon, west of Seoul. 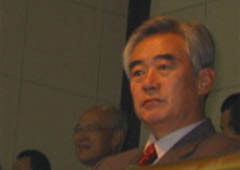 Kim Un-yong resigned from the top WTF post in early 2004 as he was under prosecution investigation over bribery and embezzlement allegations. Choue Chung-won, the newly elected WTF president, started his official job by attending the opening ceremony of the 5th World Junior Taekwondo Championships on June 12, one day after his election. He also attended the closing ceremony of the championships on June 18. 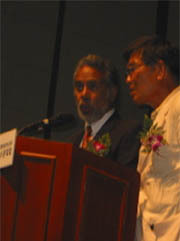 East Timor's President Xanana Gusmao (left) delivers a congratulatory speech during the opening ceremony of the 5th World Junior Taekwondo Championships in Suncheon on June 12. "As a new leader in the taekwondo community, I promise you to remain as your friend, breathing together and working together," Choue said in his congratulatory speech at the junior championships. "I also would like to suggest you go forward to leave behind a proud legacy for our next generation. I will also lead the WTF to be instrumental for all member nations, to be a harmonious organization and to be an organization with globalized administration capacity." East Timor's President Xanana Gusmao also delivered his congratulatory speech during the junior championships. Choue is also expected to attend the opening ceremony of the 2004 World Taekwondo Hwarang Festival scheduled for June 20, showing his great love for taekwondo. The organizing committee of the Hwarang festival said it will open a taekwondo exhibition room, called "taekwondo museum," on the second floor of the county's folklore material exhibition hall on June 20, displaying some 2,000 taekwondo-related articles. It said the county plans to newly build a taekwondo museum by 2007 at a cost of 4.5 billion won ($3.9 million). Under the slogan "Hwarang Festival in Unison from Short Encounter to Eternal Emotion," the organizing committee said the festival will be composed of two days of sparring competition and two days of martial art competition in several divisions. What draws taekwondo practitioners' attention at the festival is the establishment of the Hwarang Awards. "In memory of Cromwell Hernandez of the Philippines, we decided to set up the Hwarang Awards, which will be given to excellent players starting this festival," said Choi Chang-shin, head of the organizing committee. Hernandez died from injuries suffered during sparring competition of the 2003 World Taekwondo Hwarang Festival in October last year. His family members decided to donate his organs in accordance of his consistent taekwondo principles of sacrifice and respect for others.